I haven’t bought a Kinder Surprise for a long time. They cost $2 now which is just a bit too much. I mean, let’s face it, no one really likes the chocolate, it’s all about the toy. And recently, the toys just haven’t been up to standard (also, do I really need MORE little plastic figures and toys in my house?) However, yesterday I decided to get one and was pleasantly surprised with the toy it contained. In true Kinder tradition, it was cute and very well made, and really cool too. 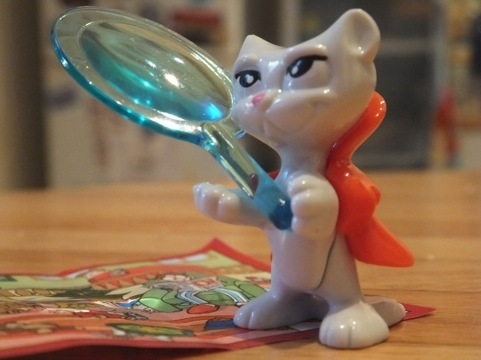 So, it’s a cool little detective cat, holding a magnifying glass, that, wait for it, ACTUALLY WORKS! 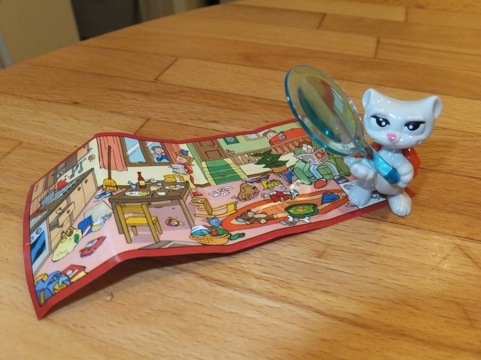 You get a little piece of paper with a picture on it, and you are supposed to use your super sleuth skills (and the cats magnifying glass) to uncover a certain amount of fish skeletons.